It's official: The royal siblings have weighed in on Prince George, and everyone appears to be very much in love. Kate Middleton's sister, Pippa Middleton, said she is "so happy to be an aunt, as I love kids," and if her work for Waitrose Kitchen magazine is anything to go by, she'll be stuffing him full of yummy snacks as soon as he can chew. Prince Harry also had a few things to say, joking, "I only hope my brother knows how expensive my babysitting charges are!" But, switching to a more serious gear, he did say, "It's fantastic to have an addition to the family," and he knows his role is, "to make sure he has a good upbringing, to keep him out of harm's way and make sure he has fun. The rest of it I leave to the parents." Good thinking Harry, plus... was it just me or did you say something about defending the little prince? Because I bet there are some scenarios in which I could picture (translation: creepily daydream about) Harry being all heroic and manly to save baby George. He has military training, he's royalty, he has really defined muscles — there are totally loads of times when we could potentially read/hear/imagine in great detail the life-threatening situations Harry would save George from. I mean, that's what Harry basically said, right? So here are some scenarios that we might manufacture if doing so weren't an international offense. (It's probably frowned upon to put small children who happen to be princes in unsafe situations, right? WHATEVER YOLO.) Because, like the rest of womankind, I'd do a lot of terrible things to see Prince Harry working those ab muscles for the forces of good. Even if that means endangering a child a little bit. Judge me all you like, haters, but it won't change how hot Harry would look in any of these fixes. 1) Prince George is kidnapped, BY MONKEYS, who mistake him for George of the Jungle, so Harry gets in there and monkey-whispers like Cesar Millan, because, duh, he is super sensitive to animal cruelty. After he's negotiated with the monkeys, Harry puts Prince George on his back in one of those sling things all the hot dads have and swings off on the vines with his muscle-y muscles. 2) In a the Hangover-type situation (we all know how Harry loves Vegas), Prince Harry carries a little Prince George wearing sunglasses in a baby pouch while he goes on a madcap (and shirtless) adventure to recover Prince William from a crazy bachelor party, because, ya know, their massive security force probably can't do it as well as Harry can. Also, contrary to public opinion, Wills is a wild and crazy guy who would for sure get lost at a friend's bachelor party. If we could also work in a high-stakes helicopter chase in which Harry is forced to jump, still shirtless, still baby-pouched, from the helicopter, that would be awesome. Necessary even. 3) Some international supervillain (yes, they totally exist outside of Powerpuff Girls, don't crush my dreams) with a serious gaming addiction has kidnapped Prince George, and it's up to Prince Harry to save him! Only problem is, he's put Prince George on the other side of a raging river, Frogger style, and Harry must leap, hop, and flex his way over the logs to the other side if he wants to get to Prince George in time. And there is a catch! If Prince Harry doesn't flex every single muscle in his torso by the time he's reached the other side, Prince George will dropped in the river, oh no! 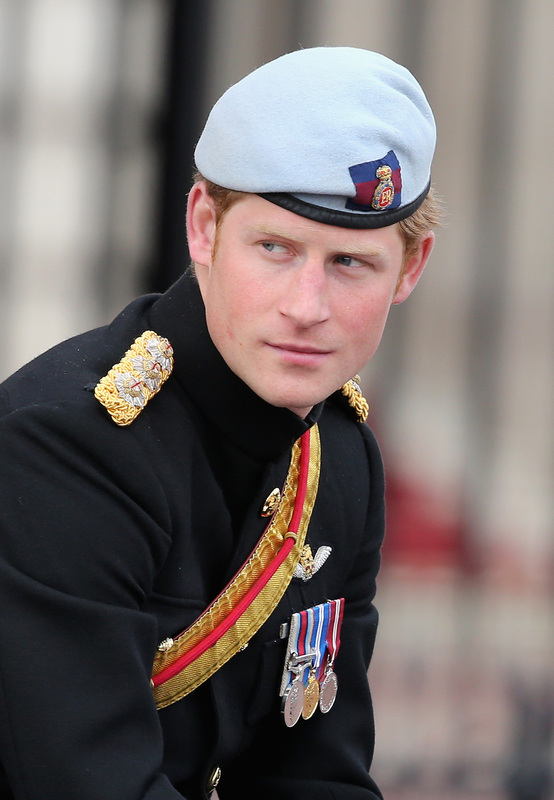 Thankfully, Prince Harry is remarkably adept at flexing and log-hopping and baby-saving, so it all works out. Prince George is safe, and once he is back in the hands of his concerned mother and father, Prince Harry manages to outwit and capture the villain. YAY GO HARRY.